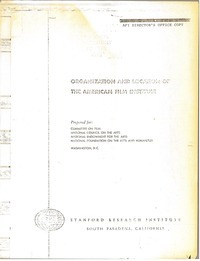 South Pasadena (Calif.) : Stanford Research Institute, 1967 Feb.
Report on developing plans to establish the American FIlm Institute. Prepared for the Committee on Film of the National Council on the Arts, the National Endowment for the Arts, and the National Foundation on the Arts and Humanities. SRI Project No. SEU-5976.